Adding to the debt burden of SriLankan Airlines, Its Chairman Ajith Dias, CEO Capt. 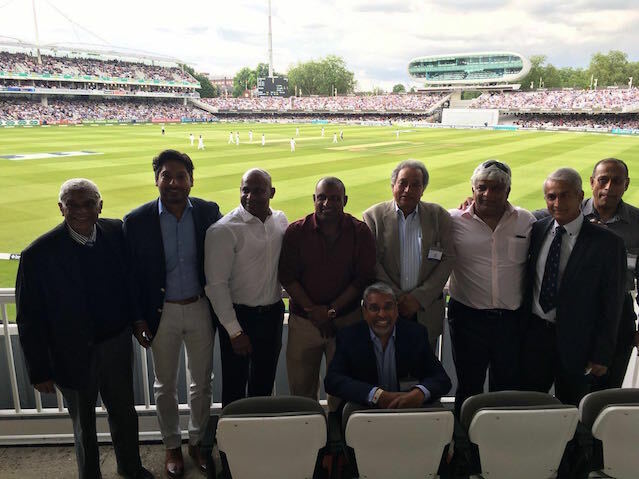 Suren Ratwatte and Chief Commercial Officer Siva Ramachandran were seeing frolicking at the airline’s sponsored hospitality enclosure during the concluded 3rd cricket Test match played between England and Sri Lanka at Lords recently. The trio were seeing taking the airline’s ‘red to black’ cost cutting programme to a higher altitude, whilst the country’s Finance Minister Ravi Karunanayake stated his displeasure co-incidentally on the last day of the test match, when questioned by media personnel during a television interview. “In absolute honesty, No ! ” was the answer Minister Karunanayake gave when the question was posed if he was happy in the manner the national carrier was being managed. Lamenting further about the board of directors the Minister said ” They are inexperienced, but they are much better than the previous lot, but have still not delivered up to expectations”. The Finance Minister Karunanayake also stated that the contingent liability of the airline had risen to a staggering sum of was Rs 467 billion and the resulting per capita debt brought about by the national carrier was costing every Sri Lankan national in the country a whopping sum of Rs 23,000 each. However recently Prime Minister Wickremesinghe promised to bail out the loss making airline by wiping out its deficit of approximately US $ 3.2 billion. This is simply to just keep the existing airline afloat and continue to have its 7000 staff employed. A recently retired captain speaking on condition of anonymity said “In the midst of these sheer difficult times faced by the airline, it is disheartening to note that Chairman Dias,CEO Ratwatte and CCO Ramacandran of the national carrier are behaving in this manner. This is similar to vultures or hyenas feasting on the carcass of a dead animal”.